On September 20th, Cornell Square Park made national headlines because of a nighttime gang-related shootout that wounded 13 people, including a 3-year old boy. This news shocked the city, and contributed to the notion that Chicago’s South Side is unsafe and plagued with violence. Richard J. Daley Academy is right across the street from Cornell Square Park and has been an Urban Initiatives partner school since August 2010. 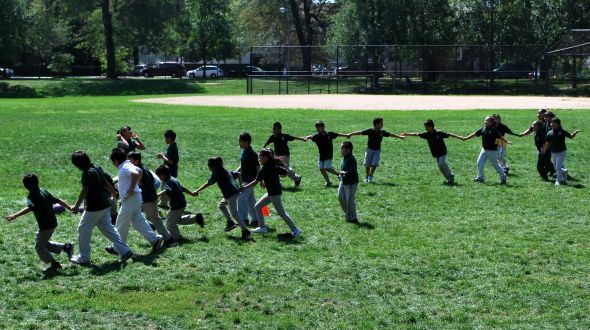 The news that doesn’t make national headlines is that all 800 students at Daley use the park every day for recess. Cornell Square Park is beautiful and expansive, including a pool, a basketball court, 3 baseball fields, a playground, and a large, heated field house where Daley students have recess during cold weather. Additionally, the park has a new turf soccer field installed by Pritzker Traubert Family Foundation’s Take the Field Initiative (in partnership with Teach for America) in October 2010. In the aftermath of the shooting (that broke a window of Daley school), recess was held indoors for a few days because of police concerns. One week later, students were back outside, using the park for its intended purpose- positive play and recreation. Some students felt anxious because of how the shooting had affected the community, so school staff and Chicago police took extra care to help students feel safe. Since Daley began partnering with Urban Initiatives for recess in the Fall of 2012, there was concern about using Cornell Square park because of its reputation as a hot spot for gang violence. Over time, REC Coordinator Rose Phinick encouraged the school community to use more and more of the beautiful park space, so that students can make the most of their recess time for fun physical activity, and to reclaim the park for the whole community. Although gang violence is an ongoing concern in the neighborhood around Daley school, students’ using the park for recess is a daily stand against violence. Many institutions and individuals choose to take incidents like these as a reason to avoid being outside and active, but the team at Daley and Urban Initiatives are working together with neighborhood people to keep Cornell Square Park a place for kids and families to be safe, healthy, and active.